Terrorists and insurgent groups acquire military ordnance, weapons and ammunition of all types and sizes. They obtain them by purchase and barter of goods for weapons, through raiding military arsenals, and hijacking military vehicles transporting weapons. Their training camps provide professional instruction on how to use them. Heavy weapons shown in this are in use in breakaway states and republics of the former Soviet Union (FSU) in many insurgent conflicts in African countries, in the Philippines, Afghanistan, the Middle East and in Central and South America. Lately, they have been used in increasing numbers in Mexico along the border with the USA. Iran has been arming Venezuela with weapons such as these and that country has been running training camps for guerrillas and insurgents from other South American countries. It is only a matter of time before military weapons begin showing up in the USA and Canada and law enforcement will be outgunned. 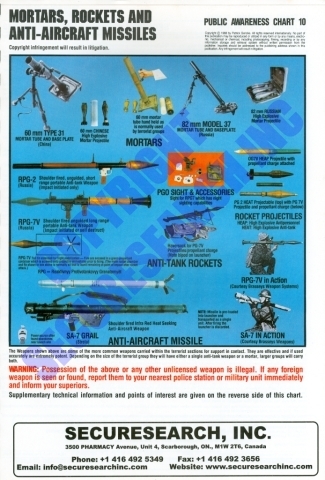 This poster provides awareness training for recognition of such weapons. Terrorists and insurgent groups acquire military ordnance, weapons and ammunition of all types and sizes. They obtain them by purchase and barter of goods for weapons, through raiding military arsenals, and hijacking military vehicles transporting weapons.